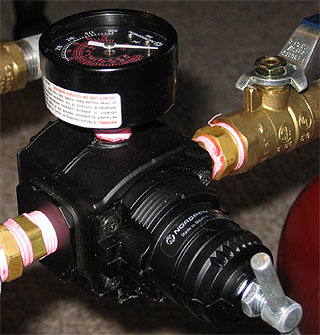 A constant air pressure system allows the consistency of CPS and the power of air pressure through one device: a pressure regulator. The regulator keeps the pressure in the firing chamber roughly the same, allowing for consistent performance in both output and range, keeping extra pressure in the source chamber. A CAP system operates with three distinct piece: a source chamber that serves as a pressurized air reservoir, a pressure regulator to keep the pressures the same, and a firing chamber. In this diagram, the source chamber is on the left; the firing chamber is on the right. The diagram is animated to agree with the following graph. PA - the pressure of the atmosphere, 1 atm or 14.7 psia. There are 8L of water in the 10L firing chamber. The chamber pressure is set at 70 psig. The 10L source chamber begins at 100 psig. The intersection of the curves on the graph above occurs when this occurs: once this quantity of water has left the firing chamber, the pressure in both chambers remains the same, falling at the same rate. However, we construct constant air pressure systems to keep the working pressure the same--without the same pressure our work is for nothing. What pressure should we fill the source chamber to provide this constant pressure through the entirety of the shot? Considering all the needed quantities, this equation provides a working relationship to properly power a CAP system and sustain its advantages over conventional systems. And the equation makes sense--larger source chambers need less pressure, greater total flows neede more pressure. Super Soaker Central Forums - Air powered homemade - 125 psi of water goodness!